First Beach, also in Olympic National Park (Wash.), and not Second Beach, is one of the settings in Stephenie Meyer’s Twilight book series. People still hop off tour buses up the road, at Three Rivers Resort, to pose for pictures with cutouts of Bella and Edward. I stop there for the milkshakes. But none of this has much to do with today’s photo. The twilight here is the period after sunset (and just before sunrise) – the bridge between light and dark. In other words, if you are snapping sunsets, twilight is the time when everyone “got what they came for,” packed up and left you to capture the more original pictures. About an hour before I took this one, I was one of at least a half dozen people literally lined up to get a shot of a sunburst peeking out of the hole in the rock formation that, in this image, leads out to the right of the sea stack. It’s kind of a cool picture, but thoroughly unoriginal. I assume, that is, that everyone but the kid shooting with her iPhone, got essentially the same thing. Not to mention the hordes who tried for the same shot before, and those who will try in the future. Watch enough sunsets and you’ll come to know that the real light show begins after the sun has dipped below the horizon. If you’re lucky, some scattered clouds will make things real interesting. I had a clear night, which wasn’t utterly disappointing since I’d been to Second Beach at least six times since last summer and each time the sun was completely hidden by massive cloud cover. In those situations, you get gray, then dark gray. I waited long enough to get a sliver of a moon, plus a mix of the red from a still-hot, though long set sun with the blue the sky turns for the hour or so after sunset. If you recall your elementary art, that turns out to be purple. This picture was taken an hour after sunset. 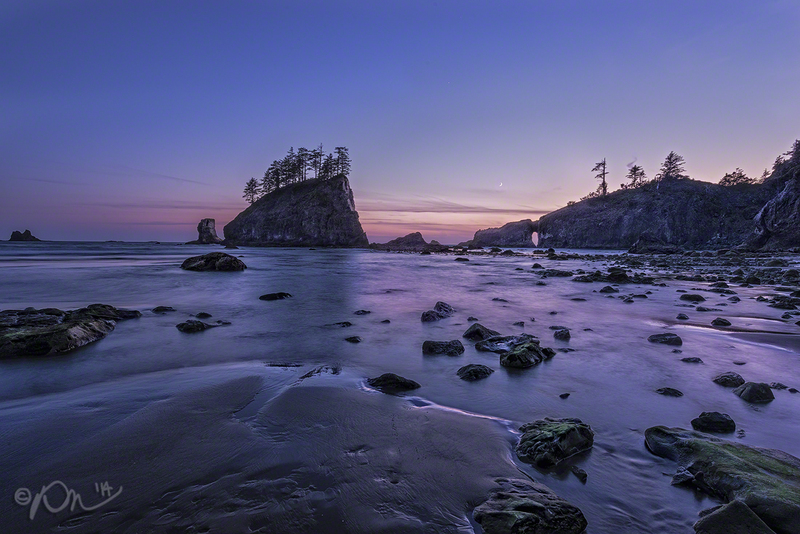 The tide was coming in at that point, which is why I was shooting in the dark at f14 and ISO 100. The resulting 6-second shutter turned the water silky while also recording movement in the slight cloud cover. What looks like sand in the vast majority of the foreground of this picture actually is incoming Pacific Ocean. What awaits afterward at Second Beach is about a ¾-mile hike, the first quarter or so on steep incline, in pitch-black forest. So you’d better have a headlamp or, at least, a flashlight. Neither will be of much help, however, if you run into any vampires. Equipment: Nikon D800, Nikkor 14-24mm f2.8 lens, Really Right Stuff TVC-33 tripod, Really Right Stuff BH-55 ballhead. Settings: 19mm, f14, 6 seconds at ISO 100. I agree with you about this time of day. The shot evokes much more mood than the sunset “money” shot (though that one is awesome as well). Nice work! Sorry, incorrect email in my first comment…….but still, beautiful. 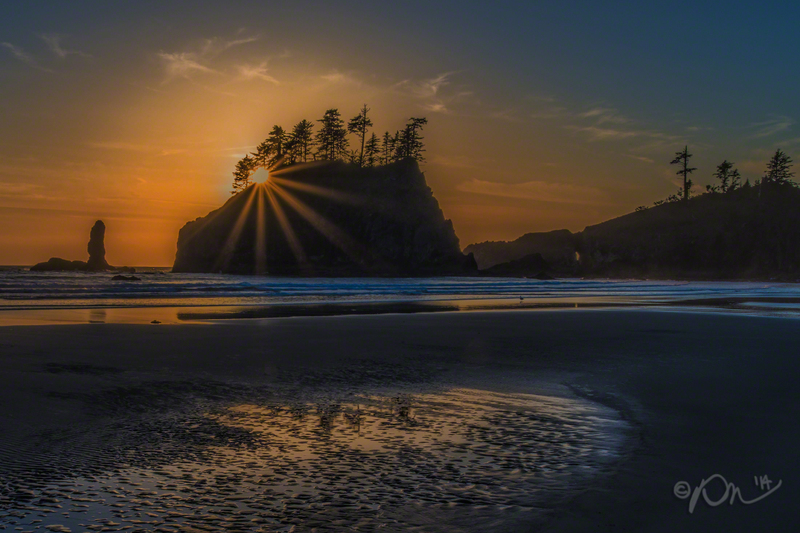 Time of day is everything in outdoor photography. Many a time my wife has shook her head as I leave the house at 2am to get a waterfall shot before the light is too bright. Thanks much, Cliff! I try to tip toe so my wife doesn’t notice how absurdly early I leave!